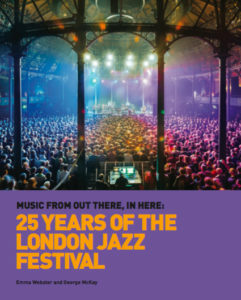 A new, freely downloadable book on the history of the London Jazz Festival mixes insights, controversies and plenty of photographic evidence. The prospect of an AHRC project report may send shivers down the spine, but fear not: McKay and his co-author Emma Webster have produced an eminently readable book, its 100 or so pages filled with excellent photographs, amusing and fascinating tales and intriguing insights into the genesis, growth and popularity of this major jazz festival. Webster and McKay (the latter a jazz fan and bassist as well as an academic) start the story way back in the early years of jazz, before the Original Dixieland Jazz Band arrived in the UK. They go on to discuss the first post-war festivals—including Nice and Beaulieu—and take in Bracknell, Camden and others along the way. There was a time when London had more jazz festivals than you could shake a stick at. Most, however, have disappeared, leaving the London Jazz Festival, founded in 1993, as the flagship. Twenty five years is not old in jazz festival terms—the wonderful trad jazz festival that is the Australian Jazz Convention has been going since 1946—but in that time the London Jazz Festival has built a reputation as one of the best jazz festivals, indeed one of the best music festivals in the world. This illuminating history is the result of a year’s digging by researchers and co-authors Dr. Emma Webster and Professor George McKay, and represents the final outcome in the Impact of Festivals project funded by—take a deep breath—the Arts and Humanities Research Council’s Connected Communities programme, which included studies on the socio-economic impacts of British music festivals and more specifically of jazz festivals. The authors’ linear narrative of the LJF—jam packed with colour photographs—captures the sense of a great adventure unfolding, a romance, if you like, between the festival and its host city. The meticulous work … in this history charts the festival journey across decades, and probes the bigger picture that surrounds it…. The outcome is I think an immensely valuable piece of work that informs our practice as a producer of live music, and at the same time marks the essential role of academic research in evaluating the impact of the cultural sector in a wider context.